Bored in the class? Finished all your projects? Sick of the bench vice putting scratches into your projects? Have I got the solution for you!! 9 out of 10 doctors recommend making a set of soft jaws will fulfill your life more than you thought possible. Material Needed: Sheet metal 5.75" x 2.5" (2 pieces if you are making a set). 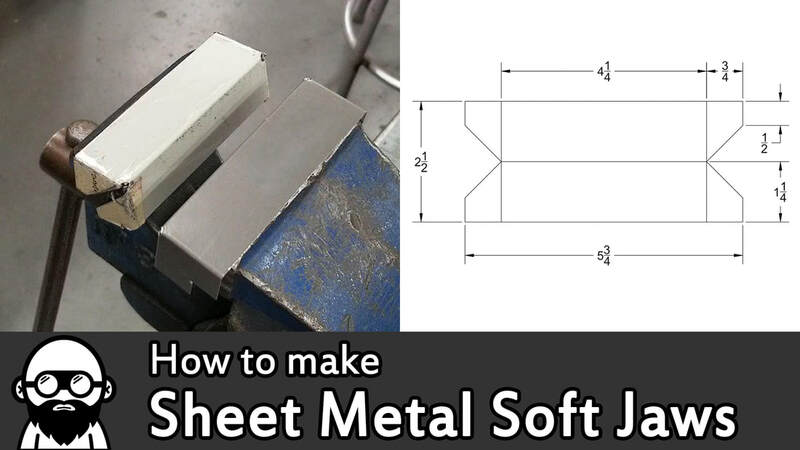 The video shows using 24 gauge thick sheet metal. 1) Cut out sheet metal to size (5.75" x 2.5") on the foot shear. 2) Layout lines on your metal to match the drawings. You should use a scribe to 'scratch' the lines for the most accurate layout. Find specific parts of the video! 4:30 meant to say foot shear instead of beverly shear. Whoops!